Y’all know that I’ve been a huge fan of K-Palette eyeliners ever since they arrived in the Philippines six years ago. They’re the easiest liquid liners to use, ever, and the price point while a bit on the high side is manageable compared to high end brands. I often get this question though: are the original K-Palette eyeliners waterproof? The answer is no, they’re not. They will come off if you get very sweaty or if you have oily skin. However, I’ve always maintained that they’re good for everyday wear if you make sure to wipe off the waterworks every time they pop up. It’s the liquid liner that I personally use 80% of the time. That’s how much I love it. 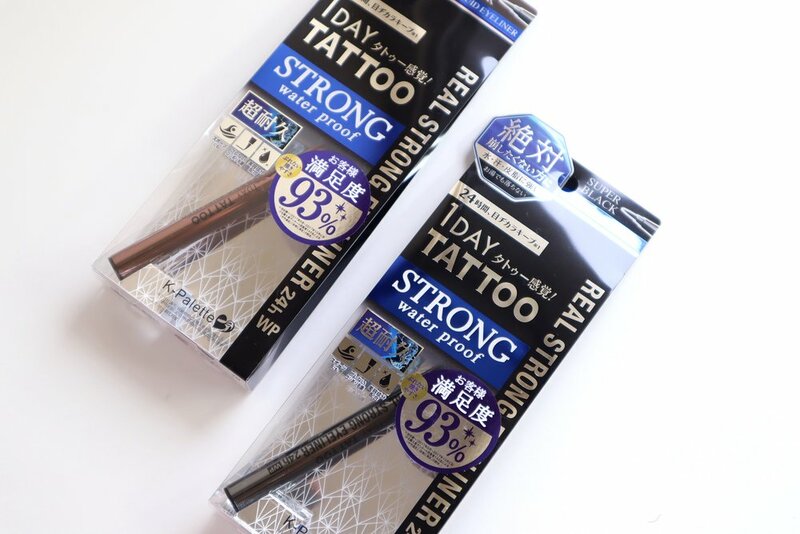 Recently though, K-Palette came out with the Real Strong Eyeliner (P945) which is touted to be waterproof and specifically labeled “for extreme sports”. This is more expensive than their original liner, which is only P795. Is this new eyeliner’s price tag justified? HELL YES. The tube itself is different from the original K-Palette liner; it has more heft, almost feels like metal, and the cap is double-sealed to make sure that the tip won’t dry out prematurely. The brush itself also feels more dense (i.e. has more fiber) and easier to maneuver. It is a bit thicker though so my lines always end up slightly thicker than normal. That being said, the formula is really where it exceeds every liquid liner I’ve tried before. Is it 100% waterproof? No, BUT. Let’s just say that if you put the swatches under running water and rub it briskly, it will fade but it will remain. If you rub it aggressively - as in, with everything you’ve got - it will flake off like certain long-wearing tube mascaras. Of course you won’t be rubbing your eyes like that unless you’re crazy! But it’s very difficult to remove with just water. Actually, it’s also annoyingly difficult to remove even with the best oil cleansers (think Shu Uemura, DHC) in the market. I used the liner while playing tennis and it does fade a bit on the inner corners. From afar though, it looks quite intact. The outer tips are in great shape after so much sweat in 30 degree-weather outdoors! With normal wear, the K-Palette Real Strong liner have stayed on my lids with ZERO smearing, fading, or smudging for 12 hours. I brought it on my recent trip to New York and even with so much walking around it’s there in place at the end of the day. Other than the staying power, I have to say that this is the blackest and most matte K-Palette liquid liner I’ve tried. 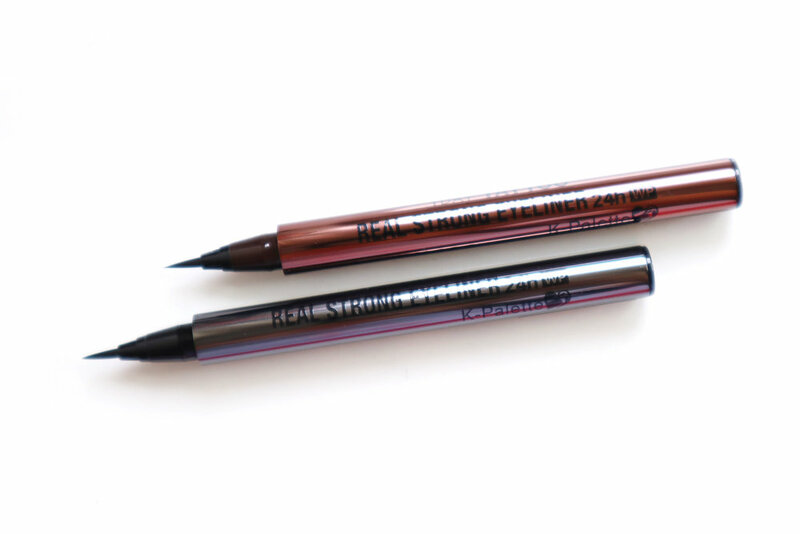 K-Palette liners have a tendency to be shiny and they usually need a couple layers to be truly opaque, but the Real Strong version is darker and richer. The finish is matte, too. There are two colors available: Super Black and Brown Black. They’re practically the same except Brown Black has a sliiiiiight brown tint to it. You’ll notice only if you look closely. The only thing I don’t like about this product is how difficult it is to remove. At the end of a long day I just want it off my eyes, you know? But even with the best makeup removers I have, there would be some residue left on the first pass. I have to do another pass in order to remove everything completely. This is not a deal-breaker for me but the extra effort does nag on one’s routine. Overall, I highly, highly recommend the K-Palette Real Strong Eyeliner to anybody who needs a reliable, dark, and easy to apply eyeliner for their sweaty/oily lids. This one’s a winner! Just make sure you have a great makeup remover, ok? You can purchase K-Palette online at https://shop.beautyboxcorp.com/ and in their retail locations in SM Beauty, Landmark, Beauty Bar, and Rustan’s.